Cut-out Sugar Cookies – Baby Feet! 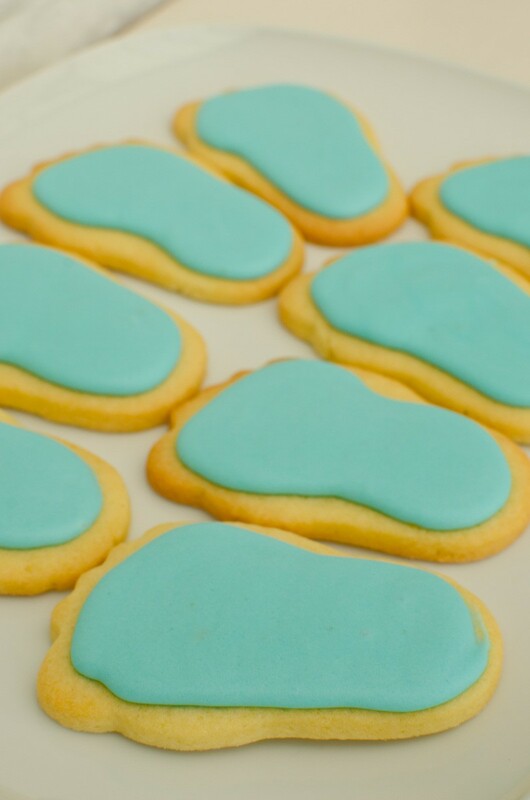 I took a box of these baby feet cookies to the baby shower. This is my first attempt at cut-out cookies and royal icing and piped icing biscuits. Well, actually second attempt for the cookies because the first recipe, from my trusty Nigella’s ‘How To Be A Domestic Goddess’, were disappointing; not at all buttery or sweet like they should be and easily burnt. So 10pm on Thursday I made a second batch which were much more successful. This recipe is made up from various sources when I noticed I needed to add more butter and to leave out the baking powder. I have to admit to much preferring a nice slice of moist cake or a tasty cupcake to a biscuit or cookie but I may be tempted to make these from time to time, especially as they can be made in advance (supposedly keeping for up to a month). Cream the butter and sugar until well mixed but not getting to light and airy stage (air will make the biscuits spread), whisk in the vanilla and then the egg. Sift over the flour and salt and mix until comes together in one lump. Divide the very soft and sticky dough into 2 patties, wrap in cling film and refrigerate for at least an hour. Kneed just a couple of times so smooth and warm enough to work. Roll out using minimal flour (can do it between 2 sheets of parchment so no extra flour needed as the flour will change the texture of the cookies) until 1/2cm thick. Cut out desired shapes and place on greased or parchment lined baking trays, allowing a couple of centimeters between each cookie. Place trays in fridge for at least half an hour or the freezer for 10 minutes until firm. Bake in preheated oven at 160 degrees fan for 12-14 minutes until just going golden around the edges, allow to cool completely on wire racks and leave at least 24h before icing. Add 100ml warm water to the dried egg whites in a bowl and whisk until well blended. Add any liquid flavourings eg vanilla extract. Sift over the icing sugar and beat until well mixed then continue beating for 10 minutes until thick. Colour at this stage. Leave for 24h before uring. To pipe on to biscuits, the correct consistency is that a knife dragged through the mixture takes 10 seconds to fill in. Pipe an outline then fill in. Size 2 to 5 nozzle is required, though I only had a size 10 and this worked too. Unlike the fickle French macaron, these are a breeze to make and the cracks and other imperfections that plague their french counterparts are all part of the character of these. 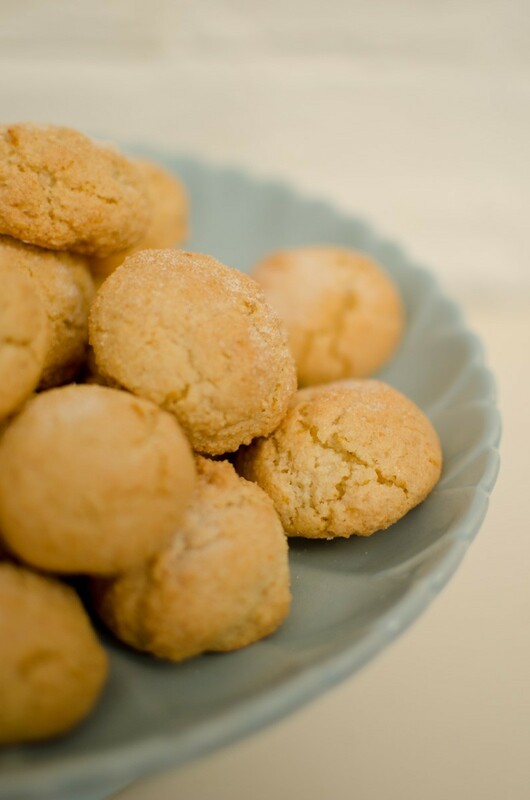 These biscuits are a chewier version of amaretti. Recipe from Christmas edition (Dec 2012) of Country Living. Heat the oven to 180 oC. Line lots of baking sheets with parchment. Whisk the egg whites until soft peaks but not stiff or dry. Add the almond essence and lemon zest. Add a spoonful at a time the mixed dry ingredients until it forms a soft mixture and leave to sit for 10 minutes. Form teaspoons of the mixture into balls in you hand and gently press onto the baking sheets. Sprinkle with another tablespoon of sugar. Bake for 15 minutes until gold brown and lift of the parchment easily. Turn off the oven and leave to cool for 5 minutes before cooking on a wire rack. Store in an airtight container for up to 2 weeks.